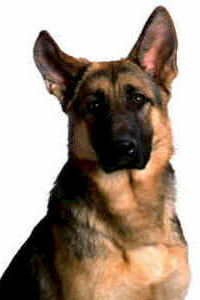 He is the second German Shepherd in our family and a descendant of our first German Shepherd dog Artis. We live in a capital of a small country in Europe called Lithuania. As my grandparents in summertime live outside the city (160 km) in the countryside we often visit them to get some fresh air and fun at the lake. Toris always likes the journeys by car and is the first one to get in the car when we are preparing. The days went by, we were roaming the city after work every evening, we called every dog pound in the city, every dog shelter, put out posters, adds on the internet, but no one has found him. Even all the neighbors were involved in the search. It was a good thing, because we knew that he was still alive, maybe someone took care of him. After a month we didn't know where to look... AND! We got a call from a dog shelter, the girl asked if we found our dog, I said no, we are still searching. She said "well my friend was staying in his lake house and some German Shepherd came to his house. Unlikely, because it is 70 km away from the city, but maybe it is your dog and you should try to call him". I took his number, called him, he said that I can come at his place because he brought the dog to the city. He was so skinny, that even the hair on his back were standing, the feet were like after manicure after running so much on the asphalt and concrete. The guy told me that they were sitting at his lake house with friends, they are all hunters. When they saw a dog near the bushes, they whistled and Toris came to them, they gave some food and he ran of. Next morning he was sleeping near the front door of their summerhouse. The guy said that everyone wanted to adopt Toris, but he said that his friend was a volunteer in a dog shelter, so at first he will ask if no one was looking for a German Shepherd. AND I AM SO HAPPY AND THANKFUL THAT HE DID! When I brought him back home my girlfriend was crying and laughing at the same time. I can say that was the best day of our lives. As I understand now he was running to our lake house where we always visit my grandparents, because the place he was found was almost a halfway. And on the same road. It took him a month and some days to get there. I can't think of other reason why he was running so far away and in that direction. But other thing what surprises me is how he found his way out of the city trough all the street with traffic and the river. A dog is not a thing you put on the shelf! A dog is a pack animal. As such he does not like to be excluded. Of course you can't take him to work but you have to find ways to show him he is part of the pack. If you can't do that, perhaps you should not have a dog, especially not a German Shepherd! I meant to say: "You wouldn't leave (instead of live) your children behind. Next time, don't leave your dog at home. Take him with you. We had to change our lives to accommodate our 3-year old female Shepherd. You wouldn't live your children behind, would you? It is like the movie, "Lassie Come Home". Thank God he you got him back and a happy ending to sad story of losing your beloved German Shepherd. They are so protective, Faithful and Loyal. I too, I have a great story on how I got my German Shepherd, Mia, check it out German Shepherd Puppy Mias Story and Mia My Beautiful German Shepherd Dog. Take care of your boy and he will take care of you!